Thanksgiving, when you don’t think about the historic complexity of the holiday, is a wonderful day when a good deal of people are off and you have an excuse to share a meal and maybe even reflect on some of the goodness in your life. I am thankful for good health, a husband who is my great friend and a baby who we are a little too obsessed with. I am also grateful for all the hope that this next year holds. We were invited to a dear friend’s house and feasted as one should on Thanksgiving. I made these tandoori sweet potato fries which were a hit. The biggest highlight for me was that Nouri took a few of her first steps! Here are some pictures from yesterday splattered with some of the cheesiest quotes I could find on Good Reads. Enjoy! For Nouri’s first birthday, I wanted to plan a day that was low key and focused on celebrating our first year of parenthood. We spent the night before Nouri’s birthday remembering how an year earlier we had no idea our little baby was coming that day. My lightening fast labor didn’t give us any time to reflect on the fact that we were about to become parents! Even as we drove to the hospital I was afraid to think it- that the next time I would be coming home, it would be as a mother. A mother! Immediately after Nouri was born, I asked, “Is she ok? Is she healthy?” And asked again and again. I was so scared that something had gone wrong in that intense finale of my pregnancy. But there she was, our sweet little baby. Going through those memories with Feraz was so special. Talking about how much love we have for Nouri, remembering her different milestones and reflecting on how lucky we feel to be her parents may have been the best part of the celebration. For Nouri’s actual birthday I wanted to keep decorations to a minimum so I simply ordered a bunch of prints of Nouri’s first year from Costco to put up around the house, ordered this honeycomb garland, picked up a bunch of balloons from the dollar store and called it a day. We ate yummy chicken biryani, saag, bindhi, raitha and samosas. The night before Nouri’s birthday, we blew up balloons and put them all over the house as a nod to one our favorite nicknames for Nouri- Noonie Baloonie. I found this birthday girl balloon dress on Amazon and felt it was too pricey for something she would just be wearing for a few hours but managed to find it for $5 on Ebay! Yes! Especially good because I don’t think she found it particularly comfortable. I had seen these awesome fruit cakes around and loved them as a slightly healthier option than a traditional smash cake. The cake was really, really easy to assemble and none of the mess that comes with a smash cake! For the birthday cake for everyone else to eat, I used my cake making cheat. After years of making cakes, I’ve found that the cake portion doesn’t really taste much different whether I’m using a box mix or whether I’m making it from scratch so I just go for the super quick box mix. Frosting is a different story. I can definitely tell the difference between homemade and frosting from a can so I usually just whip that up with whatever 4 or 5 ingredients the recipe calls for. In this case, I made a vanilla cream cheese frosting, filled the cake with raspberry preserves and topped with sprinkles. Super easy and forgiving. Probably the first and last time I will be able to blow out Nouri’s candle. Even here, she looks appalled that she isn’t doing it. 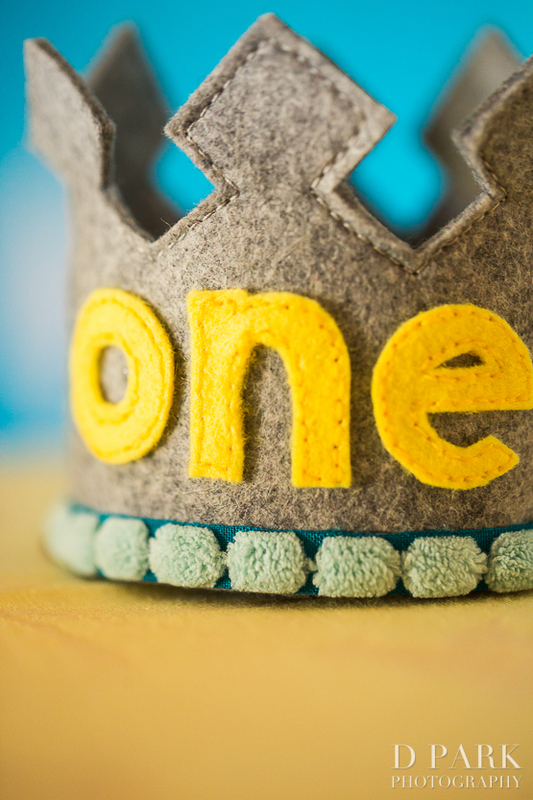 I made Nouri the “one” crown using this picture as inspiration and using this and this tutorial for guidance. I think a crown is a better idea for an older kid because Nouri basically pulled it off after thirty seconds of wearing it. But we still got a few good shots with it during our family pictures so not a total wash! I used the pictures I printed of Nouri to decorate around the house. I used them to spell out her name and to make a big number one. I selected the white border option when I printed the pictures to help them pop and used washi tape to stick them up so I wouldn’t damage the walls. Not the greatest quality but I had to include one of the only family pictures from the day. Love my little family so much!